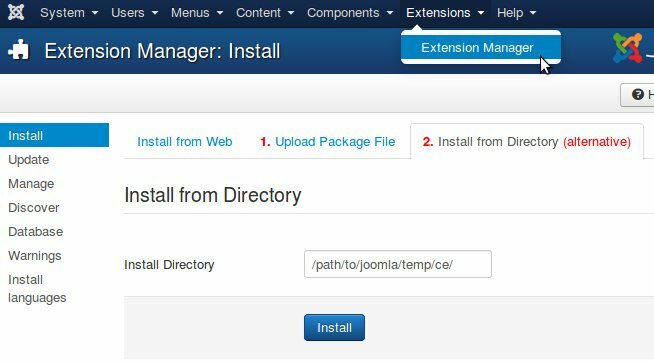 This is a short instruction on how to install Contact Enhanced extension in your Joomla installation. To install the Contact Enhanced extension use the Extensions Installer in the Joomla administration. Go to Extensions » Install/Uninstall. Go to the extensions installer in the Joomla administration, use the "Install from Directory" option to set the directory of your uploaded CE files. Click on the Install button and Joomla will install it from the given directory. Some Tile providers are free to use. This doesn't mean no limits apply, you should always check each of the provider's Terms and Conditions before using these layers for anything serious. There are some paid providers with a free quota. For example Mapbox.com provides 50,000 map views for free. Most free providers, if not all, get the map data from https://openstreetmap.org. OpenStreetMap is a free, editable map of the whole world that is being built by volunteers largely from scratch and released with an open-content license. Go to Components → Contact Enhanced → Options and under the Map tab set Map Script to Leaflet. Select Components → Contact Enhanced → Custom Values from the drop-down menu on the back-end of your Joomla! installation. This option is only available if you have a SQL Form Field type. Navigate to the Form Fields Manager. To add a new Form Field, press the "New" icon in the toolbar. To edit an existing Form Field, click on the Form Field's Name or click the Form Field's checkbox and then click on the "Edit" icon in the toolbar. This is where you can add a Form Field or edit an existing one. Contact Enhanced allows you to list Form Fields on your web site's contact forms. 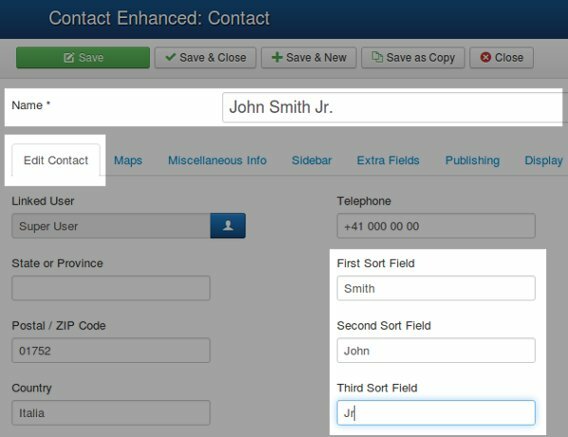 Contact Enhaced has the ability to allow you (site administrator) to assign custom fields to a contact category. Therefore you have to create a category before you create a custom field. Your users will be able to fill that custom field when they submit the form. In Contact Enhanced → Contacts → Edit Contact you have the Fields: First Sort Field, Second Sort Field and Third Sort Field, which allow you to order the contacts in a List view by them. This is very useful if you want to order your contacts in a category list by Last name. If ordering is set to Name (in the Component options, under the List tab), it will use these fields to sort the Contacts in the Category list. If they are blank it will use the Name field.Useful when you What to sort the list by Last name, but want to display the first name in the Category list view. For example, your Contact Name is John Smith, but you want to sort by last name, then in the "First Sort Field" you ad Smith and in the "Second Sort Field" you add John. 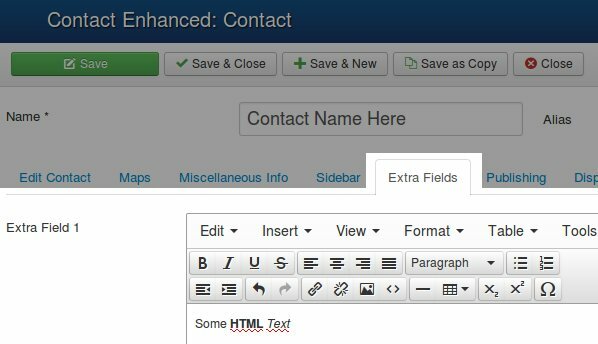 Select Components → Contact Enhanced → Contacts from the drop-down menu on the back-end of your Joomla! installation. The Contact Enhanced Manager screen allows you to add contact information to your Joomla! site. You can enter information such as name, address, phone and e-mail. You can also link contacts to registered users. Afterwards, you can use the Menu Manager to create front-end links to the the contacts.